Please advise us of ALL your sheep entries!! Our buyers are becoming increasingly interested in PGI. As a Farm Assured producer, we hope you will be eligible to sell prime lambs under the West Country PGI trademark, so long as you meet the PGI requirements listed below, primarily that the lambs have been born and reared in the West Country. There is a PGI Declaration Form which we need you to complete and send in each time you sell prime lambs at the Market. Without this declaration, which must include your Farm Assurance sticker, we will not be able to sell your lambs as West Country PGI. Born, reared and finished within the West Country Region comprising of the six counties of Cornwall, Devon, Dorset, Gloucestershire, Somerset and Wiltshire. Are no more than 12 months of age. During their lifetime have been fed on minimum 70% forage based diet and have received a suitable period of grazing, typically 2 months. (Supplements may have been fed at weaning and finishing stage and ingredients and purchasing records have been maintained on the animal feeding log). PGI Forms will be included with your cheque each week and are downloadable below or available to complete at the Office on Market day. If you have any questions or queries on this please speak to Bob Mosley on 01872 272722. Breeding sheep require full EID (two eartags as above), as currently. We are now only allowed to sell ewes which have electronic ID tags to the open market. Ewes presented to us with old manual eartags will only be permitted to be sold to our slaughterhouse/abattoir buyers. Purchasers are reminded of the procedure for movement licences accompanying sheep bought at Truro Market. We will provide you with two copies of the licence and accompanying EID eartag printout. One copy is for the retention of yourself as purchaser, the other is to be signed and sent to Defra. As before, we are happy to send off this half of the movement licence for you if you sign it on collection from the Sheep Office. If not, the new address to post your signed movement licences to is:- Animal Reporting and Movement Service (ARAMS), SouthWestern, PO Box 6299, Milton Keynes, MK10 1ZQ within 3 days. Vendors are reminded that all sheep moved to market must be accompanied by a sheep movement licence. We have licences available at our Sheep Office or contact SouthWestern as above. The "Food Chain Information (FCI)" and "Total number of animals" sections must be completed. It is essential that vendors of prime lambs and hogs who are Farm Assured also complete a PGI Form (see above) with their Farm Assurance sticker - NO STICKER = NO FARM ASSURANCE!! Each week producers achieving the top average and top price per head will each be awarded 3 points, second highest - 2 points and third highest - 1 point. In each category, only producers' top price pen to score. Minimum of 6 lambs/hoggets a pen. Points will apply to both hoggets and new season lambs (hoggets scored up to and including the second market in May). A Challenge Cup and £100 will be awarded to the producer achieving 1st place with the highest number of points, 2nd - £50, 3rd - £25 and 4th - £15. It is hoped that our much valued customers will enjoy competing. We were pleased to announce the results of our Annual Sheep Points Competition for the 2018 year at last week's market. Each week points are awarded to the producers whose lambs and hoggets achieve leading prices per head and average prices p/kg. The competition continues to recognise quality and producers’ support of the Sheep Market. Well done to all of the vendors. We are delighted to report that our Sheep Market throughput has increased yet again on the previous year. Thank you to all of our producers for your support, we look forward to working with you all in 2019. 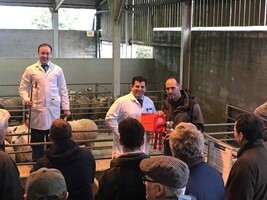 The results of Truro Livestock Market's Sheep Points Competition have been announced, recognising the achievement of our commercial producers during 2017. Each week points are awarded to the producers whose lambs and hoggets achieve leading prices per head and average prices p/kg. The competition continues to recognise quality and producers' support of the Sheep Market. We are pleased to announce the following top four accumulated scores: The Jim Large Challenge Cup and £100 prize money was presented to the highest scoring competitor Mr. R.A. Coad of Cubert.